A Rancho Penasquitos neighborhood kept their Christmas decorations in place this year; hoping to celebrate a holiday miracle. 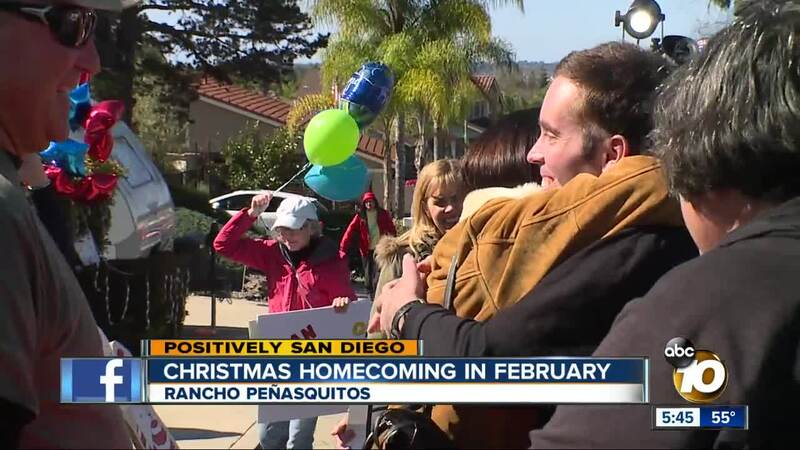 SAN DIEGO (KGTV) — A Rancho Penasquitos neighborhood kept their Christmas decorations in place this year; hoping to celebrate a holiday miracle. That hope became a reality Wednesday afternoon when they welcomed home 24-year-old Ryan Caine, greeting him with cheers along Ellingham Street as he rode the last block home in the back of a pick-up truck. "We knew he was coming back," said neighbor Janet Bark holding a welcome home sign. "And we needed to keep Christmas for him." In early December, Ryan was diagnosed with pneumonia which went septic. "We lived minute by minute for the first six weeks that he was in ICU," said his Mother Janet Caine. For those 6 weeks, Ryan was in an induced coma. Kept alive by machines. "I don't think he remembers anything," said Janet. "But we all prayed for him, we all sang to him, we read books to him. We talked to him as if he was awake the entire time." Ryan's family says they were warned to prepare for the worst but they and their doctors still maintained their hope and determination. "He took my hand and looked up to me," said Ryan's father Russ, recounting a chance meeting with one of Ryan's doctors in a Scripps Hospital parking garage. "And he said, 'we're going to get your son back.' And he delivered." After stepping down from the pick-up truck which had delivered him amid a hero's welcome. Ryan welcomed the dozens who had gathered; sharing a mantra that helped him in his recovery. "I'm a mountain man," he said. "And I'm a beast boy. I'm a warrior." When Ryan woke from his coma in January he still wanted Christmas and Disneyland. Christmas came Wednesday. His parents say Disneyland is on the way. And Ryan mentioned one more thing upon his return home. "I also hope I'm never going to go into the hospital again." His many fans responded with a warm laugh in agreement.